Too Hot for Fido? Get Alerted! Meet project Oro, the temperature monitoring watchdog. Err… the watchdog monitoring temperature probe. Well, it’s both actually! [Richard Deininger] built the project after having the AC system go down in his company’s server room. That environmental cooling is imperative if you don’t want your server hardware turned to slag. The idea is a separate piece of hardware that monitors the room temperature and will alert the on-call staff if it climbs too high. He was successful, and showing the hacked hardware around the office came up with a second idea: a temperature sensor for your car to ensure it’s not too hot for your dog. Anyone who has a canine friend living with them knows you don’t utter the word “ride” out loud lest a barking, whimpering, whining frenzy ensue. But jingle those keys and they’ll be at the door in no time. During the summer you can still take them with you for short errands thanks to the peace of mind [Richard’s] build provides. It’s simply an Arduino, DHT22 temp/humidity probe, and a SIM900 GSM modem. Set your temperature threshold and you’ll get an alert if temperatures are climbing to unsafe levels for Fido. While you have your tools out, we recommend building auto-watering and auto-feeding systems for the family pets. What’s that? You hate domesticated animals? There’s a hack you can use to chase them from your yard. We’ve all been there. Your roommate is finally out of the house and you have some time alone. Wait a minute… your roommate never said when they would be back. It would be nice to be warned ahead of time. What should you do? [Mattia] racked his brain for a solution to this problem when he realized it was so simple. His roommates have been warning him all along. He just wasn’t listening. Most Hackaday readers probably have a WiFi network in their homes. Most people nowadays have mobile phones that are configured to automatically connect to these networks when they are in range. This is usually smart because it can save you money by not using your expensive 4G data plan. [Mattia] realized that he can just watch the wireless network to see when his roommates’ phones suddenly appear. If their devices appear on the network, it’s likely that they have just arrived and are on their way to the front door. Enter wifinder. Wifinder is a simple Python script that Mattia wrote to constantly scan the network and alert him to new devices. Once his roommates are gone, Mattia can start the script. It will then run NMap to get a list of all devices on the network. It periodically runs NMap after this, comparing the new host list to the old one. If any new devices show up, it alerts with an audible beep and a rather hilarious output string. This type of scanning is nothing new to those in the network security field, but the use case is rather novel. [John Thomson] usually keeps his phone on vibrate when it’s in his pocket, and he often forgets to turn the ringer back on when setting it down to charge. This typically results in a bunch of missed calls in the meantime, so he had to devise a way to counteract his forgetfulness. You might remember [John] from the Santa-pede contest we held last December. He wanted to try his hand at yet another competition, the Avnet Dog Days of Summer contest, so he scrambled to come up with a quick fix for his situation. 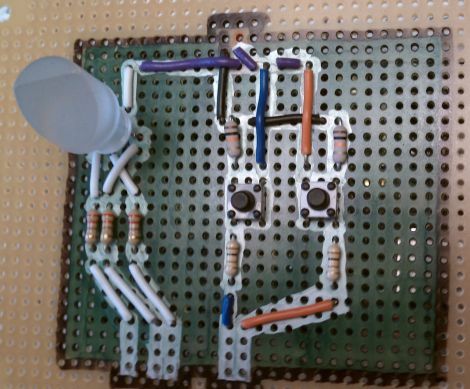 He concocted a simple circuit based on [ChaN’s] design for a “Simple SD Audio Player with an 8-pin IC” that would alert him to incoming calls, even when his phone was on vibrate. [John] used an ATtiny85, just as [ChaN] did, adding a speaker for sound output and a piezo sensor to detect his phone’s vibrations. When the piezo senses a bit of motion, the audio player kicks in, blaring a series of sounds that are sure to get [John’s] attention. Let’s admit it, you’re just a little bit vain. Heck, we’re all just a little bit vain when you really think about it. Instructables user [pdxnat] was self-absorbed enough that he constructed an LED “mood light” that alerts him each time someone mentions his user name on Twitter. The build is pretty simple, with most of the work being done on his PC. His Arduino is wired to a simple RGB LED that calmly cycles through various colors until someone mentions his name on Twitter. At that point, the client software running on his PC passes a message to the Arduino over a serial interface, causing it to wildly pulse the LED. Once it catches his eye, he stops the alert cycle with the press of the reset button, returning the LED to its previous state. As a bonus, he decided to write the Twitter-polling application in both Processing and Python, enabling fans of either language to easily replicate his work. It’s a pretty cool idea, and it would be great to see someone expand it to include other online services to provide a greater overall feel for how awesome they really are. 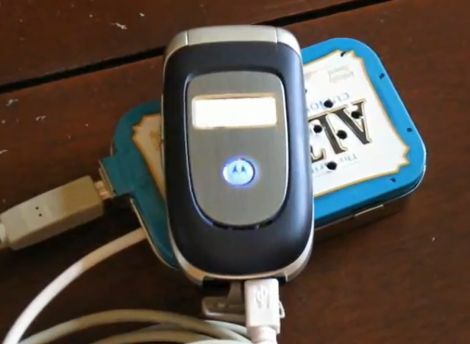 Keep reading to see a quick video of the notifier in action.